The Miggy Tree is a book that every mum would be delighted to receive and every child would be thrilled to read. 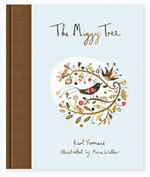 The Miggy Tree was written as a gift by Karl Yeomans for his mum, Margot, more affectionately known as Miggy, to celebrate her 50th birthday. In 2006, when Karl was only 33, his life was tragically cut short by a malignant brain tumour. Shortly after his death his wife, Julie Buxton, decided to bring this wonderful poem to life as a beautifully illustrated book and a precious gift for their two year old son Marlow and his grandma, Miggy. Karl’s eloquent and quirky prose is complemented by a set of exquisite illustrations by Anna Walker, whisking us away to the magical, whimsical world of The Miggy Tree.